He was a travelling photographer that arrived to Guadalajara in 1884. Then he realized an interesting picture collection of the city when it was celebrating, for the first time, the day of its patron Virgen de la Antigua. He immortalized the decoration deployed in its streets and in the Sta. María Church. 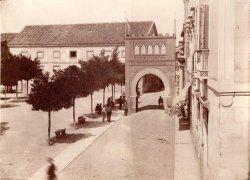 He also took the last picture of Bejanque Gate in March the same year to convince the Academy of History of its monumental value and to avoid its likely demolition. Unfortunately, in the end the gate was destroyed.